We have a slight venue change for Lincoln this week (29th April). We’re still at Lincoln Christ’s Hospital School, but we’re in the gym rather than the school hall. Apologies for the late notice – we’ve only been informed by the school today. We’ll make sure that we signpost the gym so you can find it easily, but if you have any concerns, please get in touch using the contact details on our main website at www.bevox.co.uk/contact. Just over a month ago, I celebrated my 40th birthday. There were various different celebrations throughout the week, including a family party with jelly and ice cream! 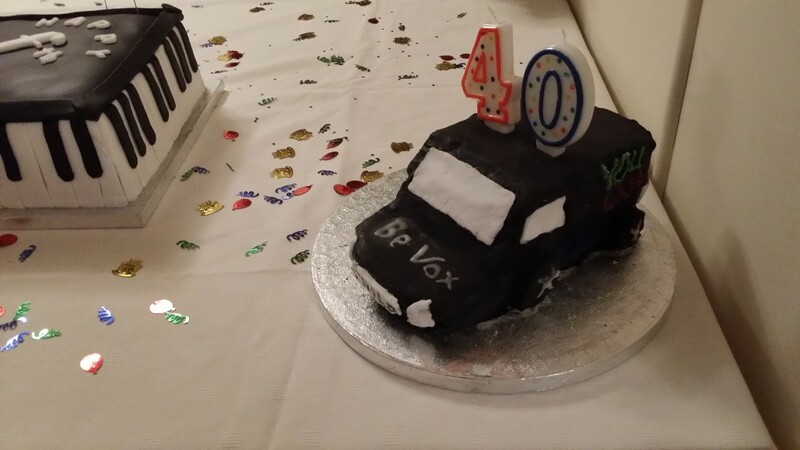 I got two different cakes at that party – a “Happy Forte-th” from Toni, and a BeVox van cake from my mum. Toni took me out for a posh meal too, and I had an incredible weekend. The BeVox singers outdid themselves in their birthday gifts to me – something I never expected, and I was utterly bowled over by everyone’s generosity. The Lincoln group, newest to the fold, had clubbed together to get me a case of wine – some gorgeous vintages that I’m really looking forward to sampling. The rest of the choir combined their resources to buy me an “experience” – two top-price tickets to see Les Mis in the West End, with hotel vouchers to make it an overnight stay. As I’m a massive fan of Les Mis but have never actually seen it in the West End, this was a really fantastic idea. Sadly, I wasn’t able to take the Les Mis experience – there was some small print that restricted the dates it could be booked, and the only dates that it was available were dates that BeVox has sessions! However, the voucher could be swapped for any other experience provided by the same company, so I took a look to see what I could do instead. 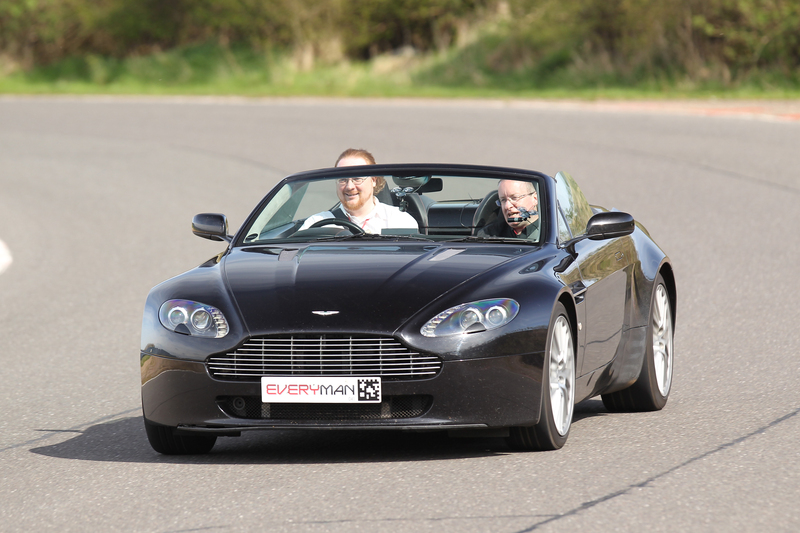 One thing leapt out at me straight away – the chance to drive supercars around a race track. I’m a bit of a petrolhead, but I’ve never had the chance to drive any top-flight cars. 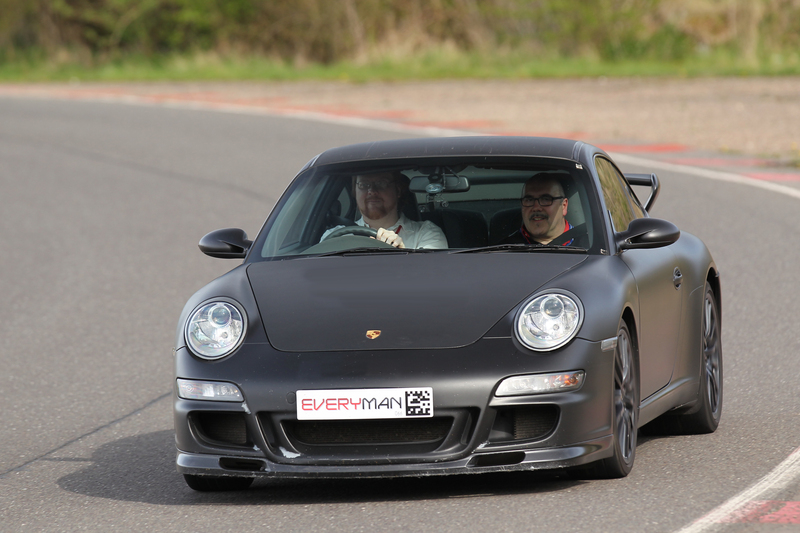 I’ve always fancied a track day but I’ve never been able to justify one – this was the perfect opportunity! So, today I’ve spent the afternoon at Prestwold racing track, driving a Lamborghini Gallardo Spyder, an Aston Martin V8 Vantage S Roadster, and a Porsche 911. Afterwards, Toni and I were taken out as passengers as a pro racing driving sped around the track in a Monaro VXR – a 6 litre beast of a machine. It was an incredible day, and I’m grateful beyond words to everyone who chipped in to make it possible. What a night! Huge congratulations to everyone who helped make “BeVox Rocks” such a sensational event, and a huge “thank you” to everyone who came to support. The crew from Sound & Light UK worked tirelessly to create a spectacular setting, and I have such respect for their professionalism and commitment. They worked until 10pm on Friday on the initial load-in, then were back at 7am to rig – they worked throughout the day and evening, and they were still working on the de-rig when I left at 11pm. Seriously hard-working – hats off to them! I know that there were parts of the auditorium where the balance wasn’t ideal, with the band being louder than the choir, but I also know that in other parts the balance was great – and the challenges of balancing a choir with a rock band, in a venue with an unusual shape and difficult acoustics, was always going to be a tough one. They did a great job under difficult circumstances, and it’s also been a learning curve for us, so we know what to do to ensure the balance is just right next time. The band did an awesome job – stepping out of the comfort zone of their usual gigs to take on the challenge of learning someone else’s arrangements, sometimes in different keys to the versions they already knew – it took some doing, and they blew me away on the night. 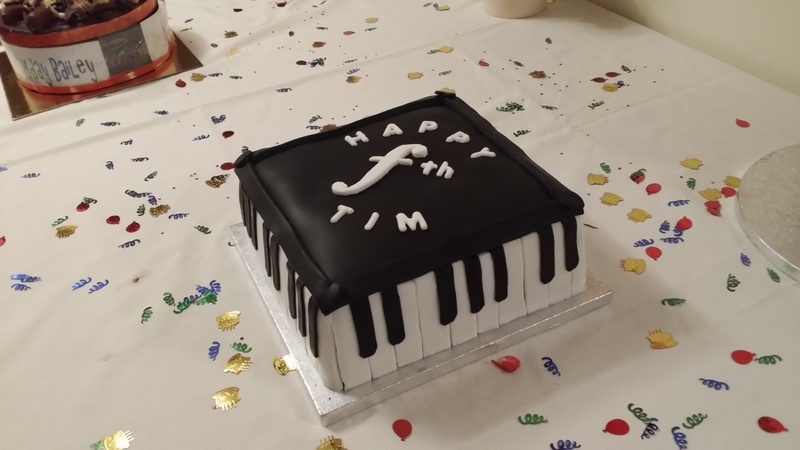 A special “thank you” to Andy for stepping in at the last minute to save the day on keyboards – no-one would have guessed that he was actually sight-reading a couple of the pieces during the concert! And as always, the greatest of “thank you”s to my best mate Dylan – another musical adventure we’ve been on together, and it’s always so reassuring to have you at my side. All the soloists did amazing work. Clare and Louise were the ultimate precise 80s duet (aided and abetted by 200 pairs of arms behind them!). Lis took a few people by surprise when her beautiful ballad kicked into a full-on rock number. Wendy injected a welcome dose of fun and humour into her song, entertaining the crowd marvellously. That random bloke who kicked off the second half tells me he enjoyed himself immensely! Dominic had the audience bouncing up and down with his rock histrionics. Toni found enough voice to sing her song despite not being able to speak all day – and then performed the arse off it! And of course Rachel had the whole audience rocking out like crazy. Each of them should feel incredibly proud of their performance. What we’re really about is the choir, of course – and what a choir it was last night. First and foremost, we had a huge amount of fun together. That’s always the most important thing for me. Before I even get to the singing, I have to say a heartfelt “thank you” to you all for so many other things. The camaraderie backstage (and on stage!) was phenomenal. The way that you all looked out for each other, supporting those who needed it and celebrating with everyone, absolutely exemplifies what we’re about. Thank you for being a true community, where the people come first and the music comes (a very close) second! I loved how we looked as a choir last night! Not only had people really embraced the spirit of the event in their outfits, make-up and hair-dos (some of which were utterly incredible – I saw a number of people in a whole new light!) – the level of animation was the best we’ve ever achieved. We’re often told by audience members that we look like we’re having lots of fun on stage, but I think last night took that to a whole new level. The energy and enthusiasm was great, and it was infectious – it’s not often people go to a choral concert and end up dancing in the aisles! Some videos from audience members have already been uploaded to YouTube (check our “Favourites” list on our YouTube channel – www.youtube.com/bevoxuk), and we’ll be posting pictures from the event to our Flickr page over the coming days (www.flickr.com/bevoxchoir). And then there was the singing. Boy oh boy, was there the singing! From the opening electrifying sound of the sopranos and altos’ “Ah” in You took the words right out of my mouth all the way through to the climactic closing vocal explosions at the end of the Stadium Rock medley, the singing was superb. I loved the way we were able to shape the sound, and take the audience on a journey – not just an out-and-out blast from end to end, but bringing subtlety to things like Mad world, True colours and Who wants to live forever?. Even in the rockier numbers there were contrasts, and that’s a testament to you really caring about the music – it’s not just about making the right sounds, it’s about infusing them with the right emotions too. I have to say, I had an absolute blast. BeVox well and truly rocks. It’s been my dream since we started the choir five years ago to do a gig with a proper rock band, and we absolutely nailed that last night. It was an absolute pleasure and honour to share the stage with you all.